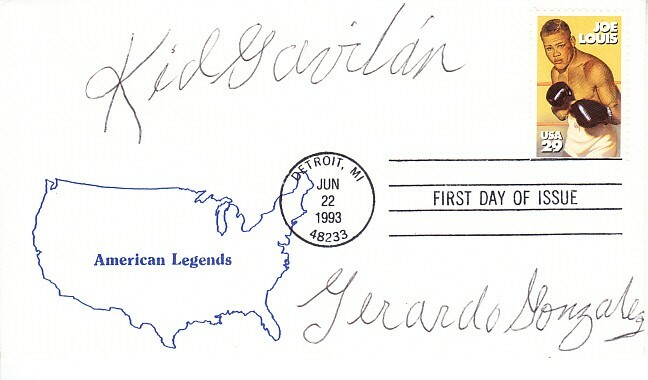 Joe Louis 29 cent stamp U.S. 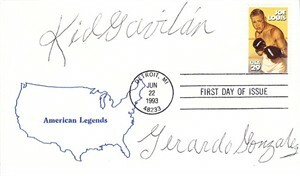 Postal Service 1993 First Day Cover autographed in black ballpoint by the late Hall of Fame boxer Kid Gavilan (died 2003) and he also signed his given name Gerardo Gonzalez which makes this item unusual and rare. With certificate of authenticity from AutographsForSale.com. ONLY ONE AVAILABLE FOR SALE.